The Southeast Stoney Trail (SEST) Project involved the construction of 25 kilometers of high speed, urban freeway around the southeast perimeter of the City of Calgary from Peigan Trail to Highway 22X. The Southeast Stoney Trail is a six lane divided highway with nine interchanges, 27 bridge structures, one road flyover and two rail flyovers. In terms of total scope, the SEST was the second largest highway project in Alberta’s history at the time of construction. 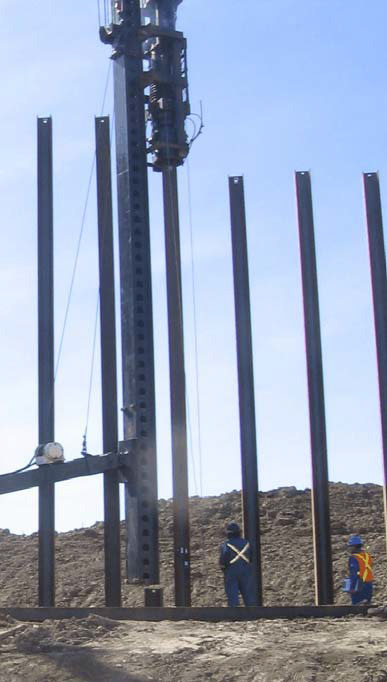 ParklandGEO was involved with the design build team providing the quality assurance pile capacity verification testing of approximately 1850 driven steel H-piles installations at the 27 bridge sites and 85 additional sign structure sites. Supporting geotechnical analysis and consulting was performed on several structures as a result of the pile test results. In total, ParklandGEO performed, just over 200 PDA tests for the project which was just over 10 percent of the piles installed.